It’s difficult to justify writing a blog about treasure hunting without mentioning the biggest treasure hunt of the last 12 months: hunting Pokemon with Pokemon Go. You gotta catch ’em all! For some, catching Pokemon is an obsession. Others dimiss the game as childish nonsense. As usual, the best option in life is to find a happy medium between two extremes. It’s a digital treasure hunt, not something to get worked up over, and hunting Pokemon can be a lot of fun. This post is about finding the fun in Pokemon Go if throwing red balls at weird Japanese monsters isn’t your cup of tea. The first thing to come to terms with if you want to enjoy Pokemon Go is that the game is not a finished product. The makers admit that they they released the bare minimum that was functional. A lot of aspects of the game simply aren’t that good. On the positive side, it’s free! There are in-game purchases but you don’t need any of them to take advantage of the things that I think make Pokemon Go enjoyable. If you do find you’re really enjoying the game and playing it a lot, though, buying some extra storage space for all the useful items you’ll pick up is definitely worthwhile. The other thing you’ll need to enjoy Pokemon Go is a decent phone and plenty of Internet data. The game uses a lot of memory and can slow to a crawl after 10 minutes of playing on a older phone, forcing you to repeatedly restart it. It also needs to be continuously connected to the Internet and to GPS, which is a real drain unless you’ve got a good contract, good signal and good battery life. So if you’ve got a good phone and the ability to see past the game’s flaws, read on. The next hurdle is that Pokemon Go is for walkers. The entire game is based around walking large distances. I like walking, and I like exploring, and this is why I enjoy the game. If you’re not a walker, the game is probably not for you. If you’re still reading, what the game actually involve is finding and catching Pokemon, surprisingly! However, it’s more than likely that this will become tedious for you at some point, depending on what sort of person you are. The same few Pokemon, namely Rattata and Pidgey, turn up a lot. The key to long term enjoyment of the game is accepting that you’re NOT gonna catch ’em all. Learn to let some of them go. The other thing you’ll be doing a lot of is spinning “Pokestops”. These are fixed points on the map that you go to, and swipe them on your phone to get the items you need for catching Pokemon. Here comes the fun bit: the Pokestops are all tied to real-world locations. A lot of them are pubs and churches, but many are unusual features or interesting locations. The game has received a lot of flack over people having their noses buried in their phones, but if you’re paying attention to what the game is telling you, you could be finding things out about your local area you never knew. Here are some examples to prove it to you. First, taking a walk along the Kennet and Avon canal, many of Pokestops are located on information boards or other sites that you might miss if you’re not paying attention. Another example is pictured to the right. 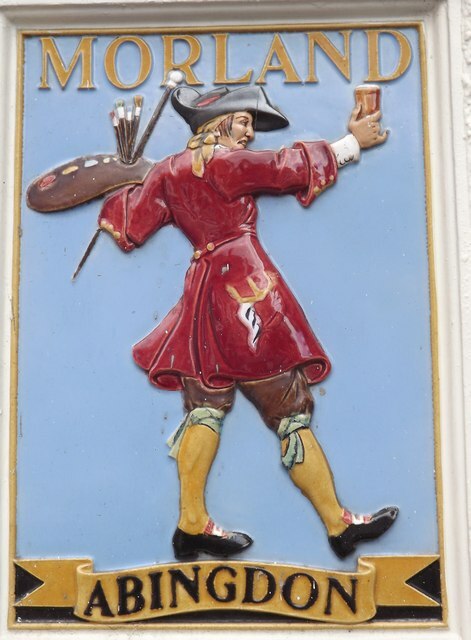 The Morland Brewery was established in 1711 and I never realised just how many of these amusing signs were built into walls in my local area. A little bit of local history I never knew anything about. There are also statues high up on the side of buildings that I’d never noticed, having never raised my gaze that high until my phone pointed them out. The whole game is geared around pushing you to visit new places. If you only walk around your local area, you’ll never find all the different types of Pokemon that are available. And when you do visit somewhere new, Pokemon Go is like a mini-tourism guide giving you random facts and pointing out random features that nobody else would bother to mention. It’s like a treasure hunt within a treasure hunt. The trick is to be able to glance at your phone once in a while to see if there’s anything interesting nearby, rather than keep your head down all the time. If that sounds like something you’d enjoy, give Pokemon Go a go. You never know, you might find that throwing red balls at pink monsters is fun too.